After three tours in Afghanistan, Marine Sergeant Riley Cooper has seen more than his share of death and destruction but the latest attack that killed a man in his command and left Riley wounded in both body and soul has resulted in a mandatory 30 day recovery period stateside. He could have gone anywhere but, for Riley, there was only one choice: Loon Lake, Vermont and the vacation cottage his parents had rented when he was growing up. The tranquil small town is the site of his best memories, happy times spent with Liam McBride and his younger sister, Meggie. The McBrides were his respite from his warring parents, his example of what a loving, supportive family should be. And Meg...she was the shining star of those memories. The last time he was in Loon Lake - six years earlier - they had one perfect night together before he shipped out for his first overseas tour. By the time Meg's letters reached him in Afghanistan, he had seen too much heartache and despair. The Marine Corps was his life and he couldn't sentence her to a life of living each day not knowing if he would live or die so he returned the letters unopened. In his mind, cutting her loose to pursue her teaching career in Boston and a life with someone else was the kindest thing he could do, even if the thought tore him to pieces. Single mom, Meghan McBride has built a good life for herself and her daughter, Fiona even if it isn't the one she had envisioned. She's back in Loon Lake permanently, has finally finished college, and is ready to begin her teaching career. Then, the man she was certain she would never see again, the man who broke her heart, the man who has no idea he has a daughter, lands on her doorstep with plans to spend the next thirty days in the cottage next door. It doesn't take long for Meg to realize her feelings for Riley never went away but were simply waiting to be reignited, especially as they get to know one another again. Is this their second chance to get things right or will it all turn to dust when Riley finally discovers what she's been keeping from him? I've already read this book twice and enjoyed it just as much the second time as the first. Nichols uses a few of my favorite romance tropes - secret baby, second-chances, best friend's younger sister - to good effect in this heart-tugging, emotional contemporary romance. Meg and Riley are both complex, fully-dimensional characters with whom I felt an immediate connection. They're good, likeable, honorable people who deserve their happy ending. I loved their chemistry, which sizzles, but, especially, their friendship, the rock-solid foundation of their love. While Fiona doesn't appear until more than halfway through the book, she's both a heart-stealer and a scene-stealer, leaving laughter and happy tears in her wake. Nichols does a beautiful job of capturing the shock, uncertainty, terror (on Riley's part), and deep, unconditional love that unfolds as Riley and Fiona come to know one another. Nothing can bring a tough Marine to his knees like the love of a five-year-old little girl who holds his heart. After I finished reading this debut book from Carrie Nichols, I discovered that the manuscript was the 2016 Romance Writers of America® Golden Heart® award winner for Short Contemporary Romance. It is certainly deserving of the award. I've added Nichols to my authors to watch list and am eager to see what she brings us next. 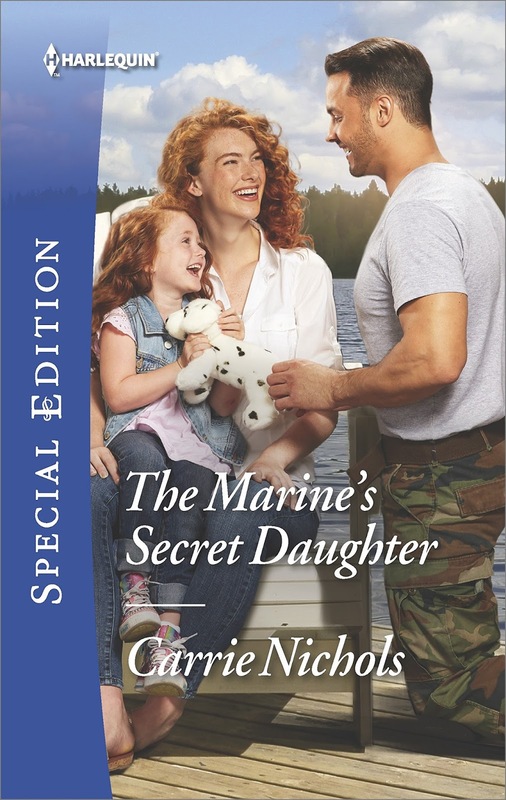 Because I enjoy celebrating debut authors and because this story touched my heart, I'm giving away one Kindle copy of The Marine's Secret Daughter to a randomly chosen person who leaves a comment before 11:00 pm, January 28, 2018. What are your favorite romance tropes? Where would you most like to go for rest and relaxation? Have you ever had a crush on a sibling's best friend? I love the fake engagement trope--I think there is just something fun about the characters having a shared secret together, and of course it forces proximity, and leads to all sorts of angst about "breaking the deal" when they want to make it a real relationship. Welcome, Jaycee! I like that trope as well. My favorite tropes are enemies to lovers and friends to lovers. I used to buy Silhouette/Harlequin romances all the time, but very few stores carry the entire line anymore. It's hard to find print copies where I live too. Good thing I buy 90% of mine in ebook these days. I enjoy the friends to lovers, etc. trope. The lady at the library told me today that Harlequin are not going to be publishing this small books anymore. I wouldn't mind staying at a little cottage in Cornwall with Aidan Turner. LOL.......Please don't enter me into the contest. They're discontinuing five of their lines but as of now will continue publishing the others. I think it's around eleven. Thanks for the info, P.J. I will let the Librarian know that. I like friends to lovers. I enjoy stories written with the humor of two friends finally seeing one another in an entirely new light. This story does sound like terrific. I like friends to lovers too, Annette and I love humor in my books! My favorite is second chances. A place for relaxation is a cottage on or near the beach. The sun, surf and sand. My oldest brother brought home 2 guys from boot camp. Keith made my heart go boom. I like fake marriages or marriage of convenience, best friend's little sister/big brother, and friends to lover. Never had a crush on a friend's big brother because none of my friends had any. Most of us were oldest. Only one of my friends had an older brother but he was old enough that he wasn't on my radar as a teen. He was probably around 22. You know, old. LOL! Awesome review, P.J.!! I have read this book twice, also. Carrie does an awesome job with all the tropes mentioned and I especially love the secret baby trope. I did have a huge crush on my older brother's best friend, but he left for the service, and I moved on. Days spent hiking Yellowstone National Park relax me, and the beauty and wonder never gets old. Do not enter me for the drawing. Thanks for visiting, Marcia! Lucky you, hiking Yellowstone. It's so beautiful! Favorite tropes include friends to lovers, marriage of convenience, secret baby, ugly duckling/fish out of water. Right now for rest and relaxation, pretty much anywhere warm. I never had a crush on a best friend's sibling. Your question made me wonder why, and then I discovered that it was because I knew too much about their romantic relationships and the casual carelessness with feelings I observed. They were only slightly older than I was, so I am sure they matured. They weren't horrible guys, just average teens. But even back then, I knew how much I valued being treated with respect and consideration. Good for you, Lil, for knowing at that young age that you deserve respect and consideration. What a great review, this book sounds so heart warming, you are rooting for the characters just from the back cover copy! I enjoy most tropes if done well, I do enjoy the thrown together in crazy situation trope (so road trip, snow storm, etc - anything where they are stuck together in tight quarters for an extended period of time). No crushes here. I was always interested in school and studying. I dated a friends older brother for a while. The first date was arranged by friends who were making sure all class members went to Junior Prom. We sort of kept dating because neither of us was really interested in anyone else. My favorite tropes are Beauty and the Beast, Cinderella, and the wounded hero or heroine. That being said, I enjoy almost all the others, too. I actually grew up not far from Loon Lake, New York. The Northeast corner of New York really feels more a part of Northern Vermont . From our house on a hilltop with the Adirondack Mountains to our back, we could see Lake Champlain, Vermont's Green Mountains, and New Hampshire's White Mountains. For R & R, we usually head for someplace in the mountains. A cabin in the woods, if we are lucky on a lake is the perfect way to spend the time. Hiking and canoeing added in would be awesome.